ABOUT: "As a performer in his own Portrait, Jason Holiday is prodigious, altogether tireless. Despite his ironic refrain of "I'll never tell," the only evident limits on what he's willing to recount are fixed on how much anyone wants to listen. There's his years of playing Houseboy to wealthy, dysfunctional white couples on Nob Hill in San Francisco, for instance. Or his other, more durable vocation as a male trollop, a "stone whore," in his words, "balling my way from Maine to Mexico, and I ain't gotta dollar to show for it," There's his turbulent childhood as Aaron Payne, an almost militant sissy living in the same house with a father who was anything but. And, of course, there's that nightclub act. All of it is baseline raw material for the film, and he knows it." 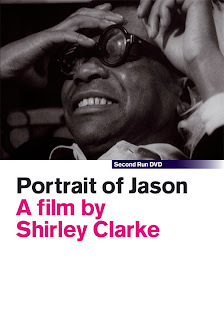 Shirley Clarke's final film, a documentary about Ornette Coleman. Watch here as as a legal video on demand stream.